Like Jim Wallis, I believe that budgets are moral documents. They reflect our deepest values. Like budget decisions, climate decisions are moral decisions. Decisions that impact the environment reveal our moral commitments. How does Barack Obama measure up on the moral leadership for the environment scorecard? 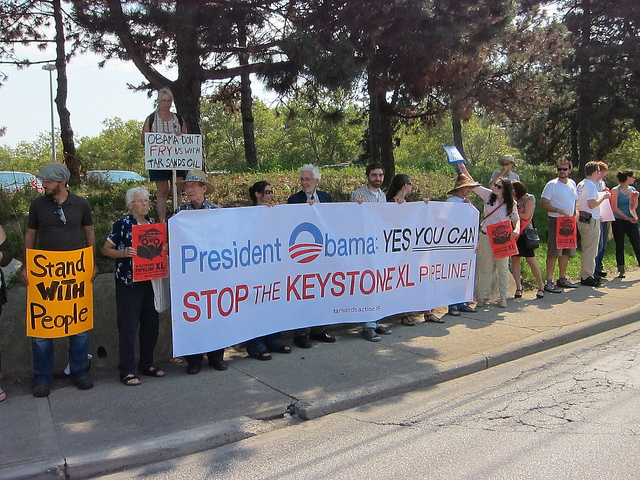 President Obama vetoed the Keystone XL pipeline Tuesday. He also forged a historic agreement with Chinese President Xi Jinping in November to reduce carbon emissions in the U. S. by 26-28% from 2005 levels by 2025. He has worked with the auto industry to put into place historic fuel economy standards. When he wasn’t able to convince Congress to pass environmental legislation, he worked behind the scenes, using the Clean Air Act of 1970 to set tougher environmental standards. All of these actions give him points for moral leadership. At the same time, some have criticized Obama for not doing enough. In 2011, Al Gore published an article in Rolling Stone magazine, saying Obama had “thus far failed to use the bully pulpit to make the case for bold action on climate change.” During the first two years of his administration, many environmental activists expected more legislation to slow climate change. Cole Stangler argues that, even given legislative obstacles, Obama could have done more through federal agencies. I would argue that President Obama has indeed turned a corner on the environment, that he sees the urgency of the issue, and that he is now exercising moral leadership on behalf of the planet and the life it supports. His recent actions all demonstrate his commitment to the environment and his new willingness to stick his neck out for his commitment. Is it enough? No. We’ve gone too far down the road of planetary destruction to turn around easily. At the same time, Obama has taken historic steps to build on other presidents’ environmental safeguards. Until now, Theodore Roosevelt (who did more than any other president to conserve land) and Richard Nixon (who created the EPA and signed the Clean Air and Clean Water Acts) were the presidents who had done the most for the environment. President Obama has surpassed them and set the stage for the work that remains to be done. May we applaud his moral leadership and work with him to save our planet.